We are the best of men; we are the worst of men. We are men who will swim through the strongest currents, brave the coldest water, and kayak in the deepest ocean; a trio of kindred spirits tied together by that brotherly bond consisting of one part adventurous spirit and two parts fantastic exaggeration. We are a force to be reckoned with, feared by all - all except our wives. In the view of some, we are also incapable of deep thought (some would say “any thought”), and communications skills are said to be lacking. We are able to frolic and play gleefully while, huddled on shore, our women watch, wait, and yes, worry. We are bold, boastful and dashing, but our immense shadows keep our spouses perpetually in the dark. We are undeterred by social convention, and our consideration is limited to wind and current, not fear and concern. In short, we are men - they are not. The current had been so strong that a grown woman standing waist deep could only make the barest headway against it. The water temperature - a numbing 60 deg. The wind, a steady westerly, bringing biting flies and driving people off the beach, and, presumably, out to sea. In such a context, the three took off on a morning kayak testostetour. The eldest of the three almost bares was a law and order type, law abiding and determined to follow the local rules. The beach opened at precisely 9:30: after that, swimmers and sunbathers ruled, and surfers and other forms of ocean locomotion were frowned upon. Thus, the wives of the three naturally assumed that the kayaks would return and land at home beach no later than 9:30, not wanting to annoy the adorable hard body young lifeguards. 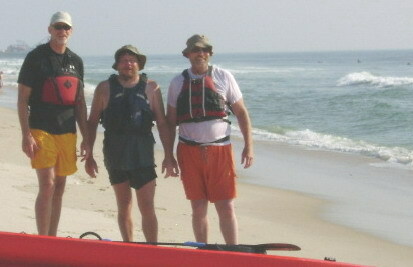 The three intrepid kayakers set off through the surf. Our bodies lean and taut, we were the veterans of the surf, the kings of the beach, the lords of the flies. We had honed our skill through endless seconds of surf jumping, and we were ready. One by one, we worked our way East through the surf and gathered in the growing swells. Yes, we were ready. We hesitated briefly, then turned North. Our arms pumping like super-charged pistons, we skimmed over the water. Fish fled in our path. Miles and miles of the ocean’s surface passed beneath the keels of our kayaks. We were admired by all, and Neptune was jealous. Who was this trio of northern water gods who had invaded his domain? The piers of Seaside Heights appeared and disappeared as the relentless paddling machines shot northward. Life didn’t get any better than this. At 9:30, the three steadfast wives left the comfort and central air to brave the blazing heat and biting flies, intent on welcoming their men back to shore. Surely they would be almost ashore, because the beach was about to open and they would be loath to crash into an innocent bather, blissfully padding in the ocean under the benevolent gaze of the vigilant and extremely well built young lifeguards. Aghast, they could not see them! The sharp eyes of the youngest of the three finally glimpsed three tiny specks on the horizon - but soon, even the specks had dissolved into the glare. The current! The icy water! The west wind! The tiring, elderly trio, literally in over their heads! What to do? We passed Seaside Heights and bore down on Ortley Beach. Should we continue to Mantoloking or turn around at Lavallette? Choices, choices. As grizzled, paddling machines, we were unconcerned about the distance we needed to cover to return to our starting point. The North continued to beckon, but we declined the invitation. We had fragile flowers waiting our return and we dared not disappoint them … as if that could be possible. Three perfectly executed turns later, and we were headed South. Once again, the creatures of the ocean sensed our awesomeness and scurried out of the way, leaving a lifeless void in our path. We quickly filled that void, and mesmerized marine manimals swam in our wake, energized by the residue of power that trailed behind us. Shore bound beach goers gazed East and thought “We are not worthy.” The sun rose in the east, and so did we! What to do, indeed. The steadfast, intrepid wives formulated a plan in which everyone was apprised. One would continue along the beach, the other two would get one of the land based vehicles into which we would put the kayaks of the weary travelers after they had landed from sheer exhaustion. The question was where. Where would they land? Asbury Park? Staten Island? Lake George? We would have driven to the ends of the earth to rescue our beloveds. In my mind I could think of nothing else but three lonely ladies who were distraught on the beach realizing that their husbands, their beloved husbands, were lost at sea … for almost an hour. Now these ladies knew what would come next in the seaside community that had lost so many to the sea, either by accident or by design. The three would go from house to house in search of a widow’s walk. The three lost seamen, now known by the acronym PEP (for Paul, Ed and Paul) were but a distant memory as the three ladies in mourning secured a 10 ‘ X 10’ widow’s walk three doors down from the house they were staying at, and immediately started coming up with “what to do next” scenarios. One thought of “where is that will, anyway?”, the other thought, “let’s order Chinese,” and the third wondered, “does the lifeguard have another boogie board”. Errant children, psychiatric facility escapees, doddering Alzheimer’s victims, and Malden Yacht Club members all tend to wander off. Traditionally there is always a care giving troupe of females available to sustain humanity and to save these unfortunates from themselves. Such was the bane and responsibility of the potential Yacht Club Widows. Quickly retracing our paddle strokes, we passed the amusement piers of Seaside Heights. Although we couldn’t see them, our ladies were within reach. Nothing could stop us now. Then the silence was shattered. We were being hailed from the shore. Who dared intruded in our space? The Malden Yacht Club racing team was not a group to be trifled with. We stifled our annoyance and deigned to placate this land-based intruder. He merely sought an audience, and we agreed to grant it, all the while being curious about the subject matter. But, lo! There in the distance! Heading back to the put in point were the heroes of this tale! But the heroines had the “wheels”. We‘d better take them back as quick as possible because the brave, but spent, kayakers would need all the help they could get taking the kayaks up the sand. At a brisk, yet safe, speed, we hurried back to base camp to welcome back the mariners. The rolling swells heightened our vigilance, as a lone surfer paddled toward us. He was a young lad, Charlie by name, who had the invisible stamp of “future Malden Yacht Clubber” plastered all over him. Clearly in awe of this exalted company, he exuded respect and wonder. He had been beseeched, by a trio of nervous Nellies on the shore, to inquire into the welfare of this august group; but once he entered our sphere of magnificence, he realized that there could be no cause for concern. The conference was brief, although we bestowed on Charlie many pearls of wisdom, and he was clearly much closer to manhood as he returned to shore. He would never forget this fortuitous incident, as he was now so much wiser in the area of domestic relations. Tales of his encounter with the Three Wise Men from Malden would circulate among the Seaside Park lifeguards many times over the coming months. It was time for us to return to home. We had enlightened and elevated the local men. We could do no more.